Natural gas is one of the world's favorite fuels, but—in its usual piped form—you can't use it just anywhere. You can't pipe gas into a car to power the engine or take it with you when you go hiking in the mountains. Nor can you can run a gas pipe out to a boat in the middle of the ocean. And if you live somewhere reasonably rural, you probably can't even have gas at home. But there's a very simple way to enjoy the benefits of gas even when normal piped supplies are out of reach: you can convert to LPG (liquefied petroleum gas)—a really convenient, super-pressurized gas stored in liquid form in a tank, canister, or bottle. Let's find out more about how it works! Photo: A typical large LPG propane tank outside a building. Conversions to LPG are relatively simple, though bring extra safety rules and regulations. Note all the emergency notices and safety warnings on the label. Photo: These two large propane tanks supply LPG to a remote cliffside building in Dorset, England, far from the main gas supply network. The basic idea of LPG is simple. If you're far from a gas main (the ordinary system of natural gas supplied to buildings through a network of pipes), simply get your gas from a large fixed tank or a portable canister or bottle. 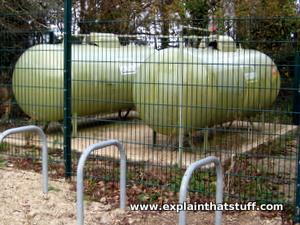 As its name suggests, LPG is a fossil fuel closely linked to oil. About two thirds of the LPG people use is extracted directly from the Earth in the same way as ordinary natural gas. The rest is manufactured indirectly from petroleum (crude oil) drilled from the Earth in wells in the usual way. Chemically, LPG is a mixture of two flammable but nontoxic gases called propane and butane. Both of these are hydrocarbons (their molecules are made from different combinations of hydrogen and carbon atoms): propane molecules (C3H8) have eight hydrogen atoms attached to three carbon atoms, while butane molecules (C4H10) have ten hydrogen atoms bonded to four carbon atoms. LPG sometimes contains a variation of butane called isobutane, which has the same component atoms (four carbons and ten hydrogens) connected together in a slightly different way. Chart: LPG packs more punch: both propane (red) and butane (blue) contain considerably more energy per cubic meter than natural gas (yellow); in other words, they're more calorific. 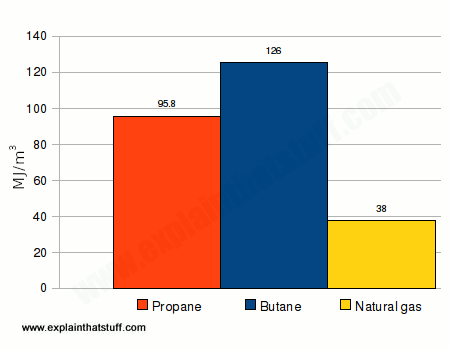 Butane holds more energy than propane because a molecule of butane has three more atoms than a molecule of propane and three more chemical bonds holding it together. More bonds break when you burn butane, so more energy is released during combustion. Figures in megajoules per cubic meter. Data from Calor Gas UK. Exactly which of the gases is present in LPG depends on where it comes from, how it is supplied, and what it is being used for. LPG typically contains a mixture of butane and propane gases, and tiny quantities of other gases are also naturally present. Since LPG is normally odorless, small amounts of a pungent gas such as ethanethiol (also known as ethyl mercaptan) are added to help people smell potentially dangerous gas leaks, which might otherwise go undetected. Pure butane tends to be used more for small, portable LPG supplies in such things as boats and gas-powered barbecue stoves. 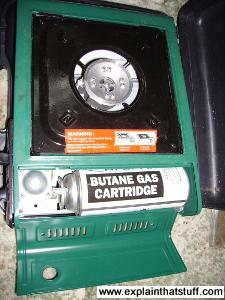 Since butane doesn't burn well at low temperatures, portable canisters often contain a blend of 20 percent propane and 80 percent butane; propane has a much lower boiling point so it's less affected by freezing temperatures and generally better for year-round outdoor use in cold climates. Larger household tanks are more likely to contain a majority of propane (typically 90 percent propane in North America). Sometimes, LPG cans are color-coded to reflect the gas inside. 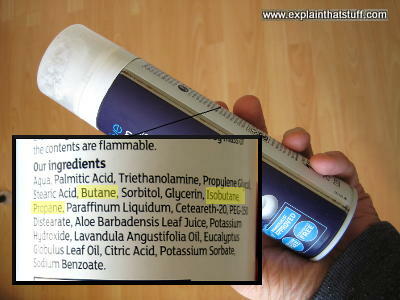 In the UK, for example, Calor and other suppliers sell butane in blue cans and propane in red or green ones. Artwork: Propane-based LPG is compressed into 274 times less space than its gases would normally occupy, forcing it to turn into a liquid. Butane-based LPG is compressed slightly less into about 233 times less space. 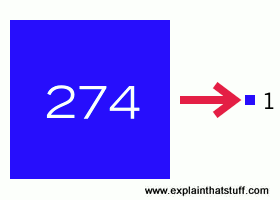 If you could see inside an LPG tank or bottle, you'd see a liquid not a gas. That's because the propane and butane have been compressed so they take up something like 274 times less space than normal. (By comparison, the air in a typical car tire is pressurized to roughly 2–3 times normal air pressure—so the gas in an LPG tank is squeezed about 100 times more!) Like lowering its temperature, compressing a gas (increasing its pressure) eventually turns it into a liquid. Compressed in this way, LPG takes up relatively little space, so those big LPG tanks you see next to people's homes actually contain far more "gas" (in liquid form) than you might suppose. In the same way, even a tiny canister of camping gas (slightly bigger than a jam jar) contains a surprising amount of energy for your cooking. When you use LPG, it's released slowly and safely from the container through a valve and, at that point, turns back into a gas. In that form, it's just like natural gas: it's a fuel rich in energy that you can burn to release heat for cooking, heating, or powering something like a car engine. Photo: Aerosol cans like this shaving foam often use propane, butane, and isobutane as propellants—which makes the contents dangerously flammable. Roughly half the LPG people use is consumed in homes for heating and cooking (in other words, instead of piped natural gas). Typically, this kind of LPG is delivered by road to a large tank placed safely outside a home or other building (for safety reasons). It's also possible to buy reusable gas canisters (from such companies as Calor in the UK) for powering standalone stoves, heaters, barbecues, and outdoor patio heaters (now frowned upon because of the energy they waste to the open air). Tiny LPG canisters are also widely used in portable hair-care appliances, such as hair-curling tongs. The rest of the LPG people use (the other 50 percent) is split roughly equally between cars and industrial uses (such as gas burners on construction sites). Although LPG provides less than 2 percent of the total energy people use, it's still one of the most important alternatives to gasoline. Something like 6 million European vehicles (mostly low-emission buses and cars) run on LPG and there are about 17,500 gas stations in Europe supplying the fuel. Photo: Portable cooking: This camping stove has a single cooking ring at the top, powered by the white cylinder of butane gas you see at the bottom, which looks much like an ordinary aerosol can. "Camping gas" is probably how most of us are likely to come across LPG. The main reason for converting to LPG is its superb portability and convenience: it can be used in remote places where ordinary gas supplies are unavailable. That doesn't just mean rural homes: large LPG canisters are extremely useful in disasters and emergencies where supplies of electricity and gas have either been interrupted or never existed in the first place. Although LPG is a fossil fuel, it's relatively clean compared to such things as coal and oil (it makes less air pollution—fewer soot particulates, nitrogen oxides, and sulfur) and produces fewer emissions of carbon dioxide (which cause global warming). The two big disadvantages of LPG are safety and cost. Keeping a gas pressurized at 274 times less space than it would normally occupy requires extremely sturdy metal tanks and it's hardly surprising that LPG containers do occasionally explode. Explosions of gas canisters on building sites are far from uncommon, for example. In theory, since LPG is highly flammable, transporting it by road and storing it in large tanks in populated areas should be much more dangerous than piping natural gas underground. Having said that, LPG suppliers go to great lengths to ensure safety and LPG is generally recognized as being just as safe, all-round, as an ordinary natural gas supply. Cost is another big drawback: LPG is typically several times more expensive than ordinary natural gas. But if you can't get piped gas, and LPG is your only option, maybe that's not really such an issue. USA: Why use propane at home: Clear, informative, and reliable consumer advice site operated by the Propane Education and Research Council (PERC). UK: UKLPG: The British trade association for the LPG industry has lots of reliable, detailed information about switching to LPG for different applications (at home, at work, and in your vehicle). EU: Liquid Gas Europe: A trade body representing LPG suppliers and distributors; their site has quite a lot of useful information about how it believes LPG can help to meet European energy and environmental objectives. USA: Fuel economy information: Propane (liquefied petroleum gas): The US Government's Fuel Economy website explains the pros and cons of running your car on LPG. UK: Drive LPG: A British site designed for motorists who have LPG or want to convert. Includes a calculator to help you figure out potential savings and a list of official LPG gas (filling) stations. 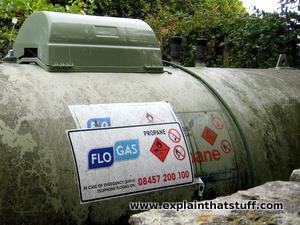 UK: Which gas bottle do I need? : A useful reference from the Calor Gas company explains the various different kinds of bottled propane and butane available in the UK. Alternative Energy for Dummies by Rik DeGunther. Dummies, 2009. A very broad look at all kinds of alternative and renewable energy, including chapters on electric cars, LPG vehicles, and so on. In other words, not just a book about LPG! Liquefied Natural Gas Makes Qatar an Energy Giant by Stanley Reed. The New York Times, August 5, 2015. Why a third of the world's LNG supply now comes from Qatar. Schools Turn to Propane Buses as Stricter Emissions Standards Loom by Diane Cardwell. The New York Times, May 21, 2015. Air pollution concerns help to explain the five-fold increase in alternative fuel fleet vehicles between 1995 and 2011. A Butane Recharger for Your Cellphone by Steven Cherry. IEEE Spectrum, July 2, 2012. A solid-oxide fuel cell, running on butane, offers 14 full charges for your smartphone. Propane Pickup Brings Alt Fuel to the Super-Duty Set by Ben Mack. Wired, January 28, 2009. Roush Performance has converted a Ford F-150 pickup to run on propane. Rural struggle without mains gas by Martha Buckley, BBC News, 25 October 2006. The difficulties of living in a remote area with LPG as your main household fuel. Are gas-powered cars the future? : BBC News, 5 December 2001. This is a British site where "gas" means LPG, not gasoline.